Haruki Murakami is one of those authors that both intrigues and intimidates me. 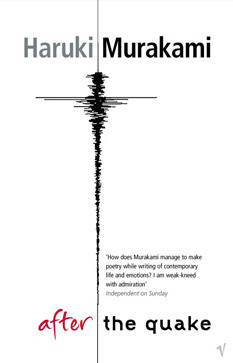 The second book I read by him is one of his earlier collections of short stories, After the Quake, set in the months following the earthquake that shook Japan in 1995. Murakami's stories always feel so ephemeral to me. There is an other-worldly, dream-like quality to them that I can't quite grasp. Only hours after finishing the book, I often can't remember what the stories were, though I remember the atmosphere of the whole collection. I enjoyed After the Quake much more than I did The Elephant Vanishes. Here, the characters are grappling with a huge and horrific event, so there isn't the same "meh" attitude towards life that pervaded The Elephant Vanishes. The stories all center on characters who look back over their lives and try to understand when they were derailed, what defines them. And often, they find that they've allowed themselves to be defined by other people or things that they don't like thinking about. My personal favorite story was about a woman in Thailand who learns how to let go of the past so that she can move forward. A simple lesson that shows up again and again in literature, but Murakami gives it a true touch of grace. 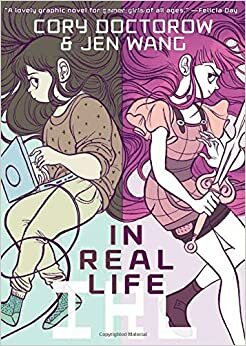 Cory Doctorow's In Real Life was much less successful for me. There are a few positive points. The main character, Anda, is a kind, shy, and slightly overweight girl who really comes into her own and gains confidence through online gaming. And the artwork is really beautiful - Wang did a brilliant job in the way she used color. But the premise of the story really bothered me. 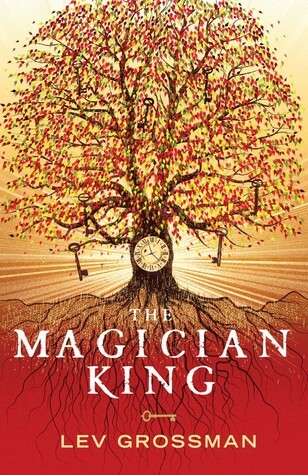 Almost immediately after finishing Lev Grossman's The Magicians, I went on to read its sequel, The Magician King. I liked this one much more than the first book, though there was a scene towards the end that I found very disturbing. The main character, Quentin, wasn't quite as insufferable in this book because he became aware of what a jerk he can be and seemed to take steps to remedy the situation a bit. The Magician King maintains the humor and appreciation for the absurd that the first book featured, which I really liked. And the audiobook narrator, Mark Bramhall, is pretty brilliant. I think he's a significant part of why I continue with these books. And people tell me that the last book in the trilogy, The Magician's Land, is the best of the bunch, so I am in line to get that one on audiobook, too. Hopefully it just continues to get better and better! I do think The Magicians books continue to get better until the end of the third one. That scene at the end of the second is supposed to be disturbing, of course. I've been avoiding In Real Life for some reason, but now I don't feel guilty about not picking it up. I plan to read The Magicians next year, so it's encouraging to see that you liked it enough to at least pick up the sequel. And the only Murakami I've read is Norwegian Wood, which didn't blow me away. I will try more, but I'm not sure if he will be an author for me. Please let me know what you think of The Magicians' Land. I thought The Magician King was head and shoulders above The Magicians, but the more distance I have on it, the more bothered I am by that scene at the end. Like, from an ideological standpoint, rather than a plot standpoint (I get that it's supposed to be upsetting). I dunno.